I can't wait to see all the little fat men running around the field clobber'n one another. Don't worry too much about what names other people are using - I'm pretty sure I'm not the only one looking forward to playing as many morbidly obese games as possible. I look forward to morbidly obese games as a burgeoning new genre. Updated with the title screen. I have half the gameplay done. I just need to finish the other half, and the menu stuff. I hope I finish in time! Also, I have to know... which nation did you choose? It's a nation larger than borders can hold. It's a nation governed by drive, whose currency is passion, and chief import is admiration. But yeah, USA is selectable. But yeah, USA is selectable. Well, technically, America does play rugby, but not enough to acknowledge it. Which is why I mentioned it. I just figure you can't have a game about obese people worldwide that doesn't include the US. Uploaded the half finished version I was able to get together during milestone week . "Tom, never talk this way again!" :D Fun. Sega, you can't advertise this is unfinished! This is art, man! Final Product. Live up to your signature quote! I pressed hard on that left key for those two minutes, and boy was I rewarded. I think. Haha thanks. Ironically enough, my additions are specifically to push the spirit of that quote, and to communicate some of my feelings on simulation sports games. Updated the download link. Changed to zip as it's more compatible, and fixed a bug or two. Added a couple of comments as well . And thank you very much for the kind words everyone! Wow. 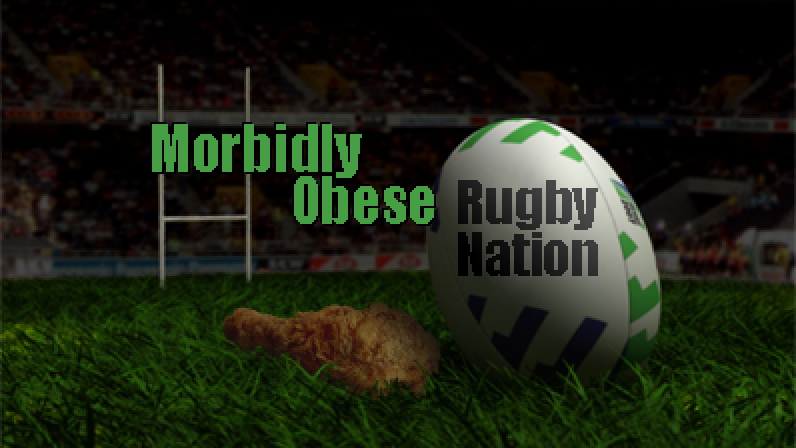 I now love a good game of obese rugby. The best joke game in the contest It got my vote, anyway.